The 69-year-old pedestrian dies when she is hit by a car that left the road, the Cumberland County Sheriff's Office says. 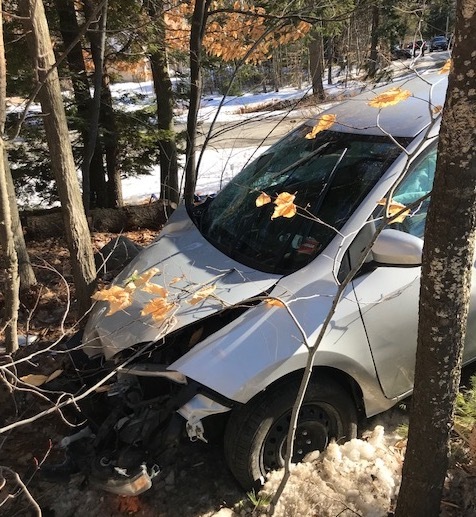 A 69-year-old woman was struck and killed Monday as she walked along Whites Bridge Road in Standish when a vehicle left the road and careened into her, police said. Nicholas Breed, 20, of Topsham, was driving a 2015 Toyota Corolla when the car struck and killed Eileen Garroway of Standish, according to the Cumberland County Sheriff’s Office, which is investigating the crash. The crash was reported shortly after noon. Police said they do not suspect that alcohol or drugs were factors, but Breed’s blood was drawn and will be analyzed for any intoxicants, as is standard in such cases. Capt. Scott Stewart, in an email, said that Breed voluntarily gave up his phone to investigators. Police do not know if he was texting at the time. “We are looking into the phone,” Stewart said. The crash site is along a main access road between Route 35 and the Saint Joseph’s College campus, where Breed is a student, police said. Garroway is listed as the owner of a single-family home on Whites Bridge Road, which is two lanes wide with woods close to the narrow shoulder. There is no sidewalk. The speed limit in the area is posted at 40 mph. Whites Bridge Road was closed to traffic after the crash, but was later reopened.